The Brother DCP-7030, DCP-7055 and DCP-7065DN are nice and cheap laser printers and, although they claim Windows, Mac and Linux compatibility, the linux compatibility has some fine prints. Brother provides binary drivers for RPM and Debian-based linux but no source code. If you are running linux on ARM, FreeBSD or any non-RPM or non-Debian-based linux, you will be out of luck with these binary drivers. While there are some instructions out there to run Brother binary linux drivers in Linux compatibility mode under FreeBSD, this can be cumbersome to setup in a FreeNAS jail and will still not work on ARM-based setups. I spent a day figuring out how to make my DCP-7065DN work with CUPS in a FreeNAS jail so that it could be published as an Airprint printer for my iOS devices. Here is how I got it to work (the same instructions are likely to work on any “nonstandard” linux setup). Note that DBUS is also needed for this setup to work (it wasn’t already installed in my FreeNAS Jail). Once CUPS is started, point your browser to http://<localhost or your IP>:631 and confirm that everything is up and running. This is only needed if you cannot run the original Brother drivers (if you are running a RPM or Debian-based system, by all means, go with the official Brother drivers). Follow the instructions on GitHub to compile and install the drivers. I followed a guide available here: https://davidandrzejewski.com/2015/12/26/make-any-printer-airprint-compatible-on-freebsd/ and adapted some steps for my setup. Once setup, print a test page (from the printer’s “Maintenance” menu) to confirm that everything works. If all went well, the test page should print OK. Restart CUPS (service cupsd restart). 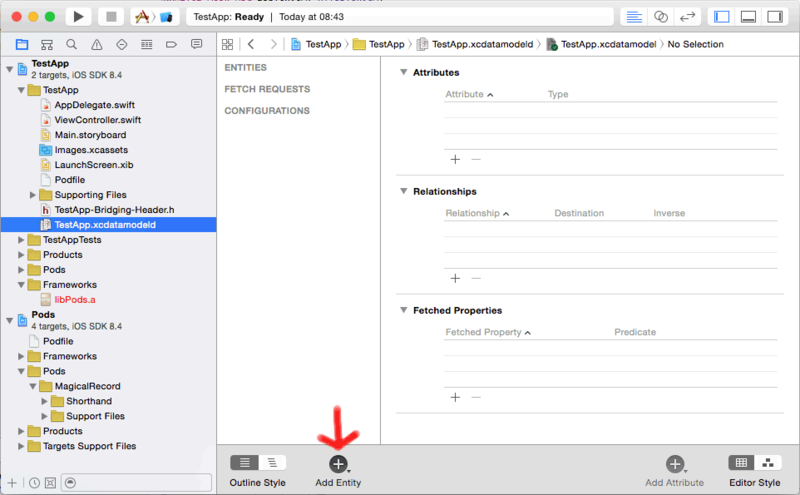 In the section setting ‘DOCUMENT_TYPES’, add a new line just under “‘application/postscript’: True,” that says “‘application/vnd.cups-postscript’: True”. At this point, you should be able to AirPrint from your iOS devices. 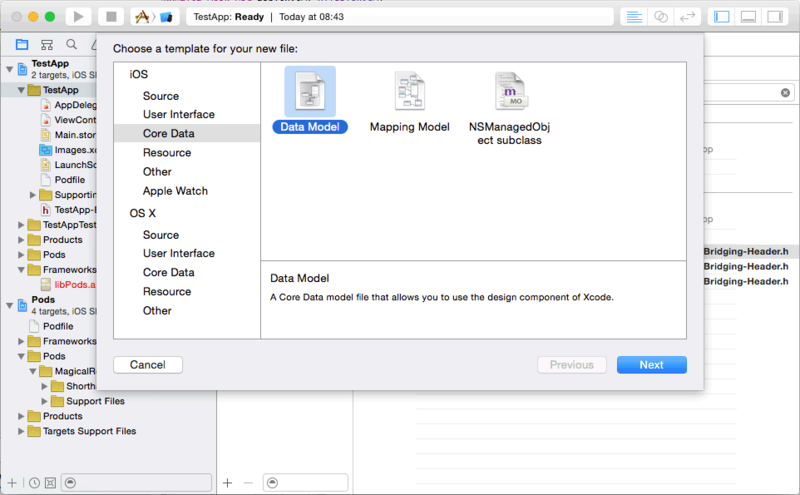 Note that this tutorial was written for Xcode 6.4.
make sure that “Use Core Data” is NOT selected. Since we’ll be using Core Data through MagicalRecord, we don’t need to have all the boilerplate Core Data code. 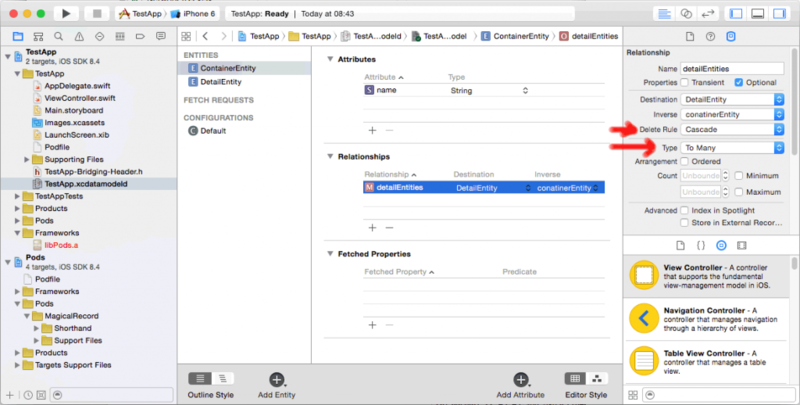 CocoaPods is a dependency manager for Objective-C and Swift projects. You can find all kinds of useful information about it on its home page. 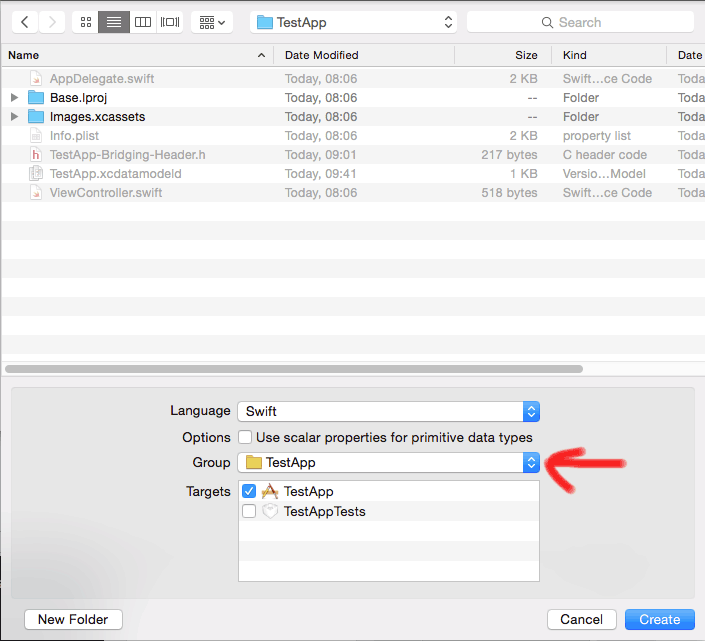 An empty podfile has been created in your project folder. 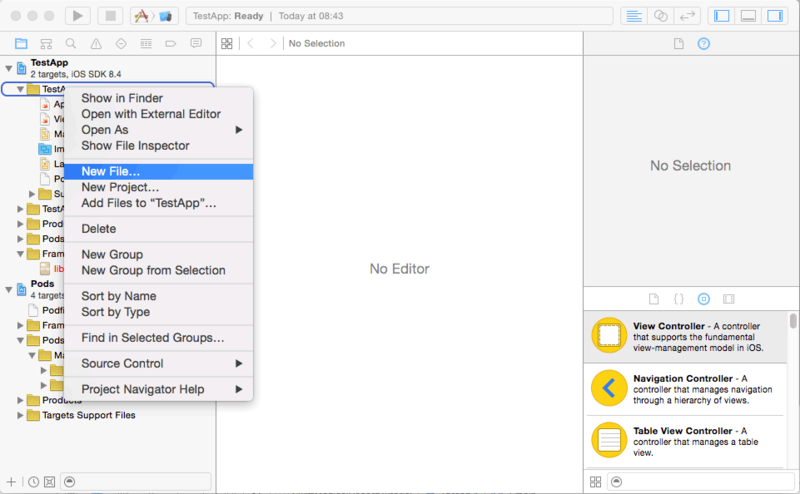 You can add this to your Xcode project by dragging the file into your Xcode Project Navigator (this will enable you to edit the file straight from Xcode, which is convenient). I added a commented out line for use_frameworks! to remember that this has to be explicitly disabled for MagicalRecord to work. It would be tempting to install Alamofire using CocoaPods as well but because Alamofire is in Swift, it will require the the use_frameworks! to be activated. Bottom line, you can’t install both Alamofire and MagicalRecord with CocoaPods (if someone knows how to do it without getting into various issues with MagicalRecord, let me know because I have not figured that one out yet). 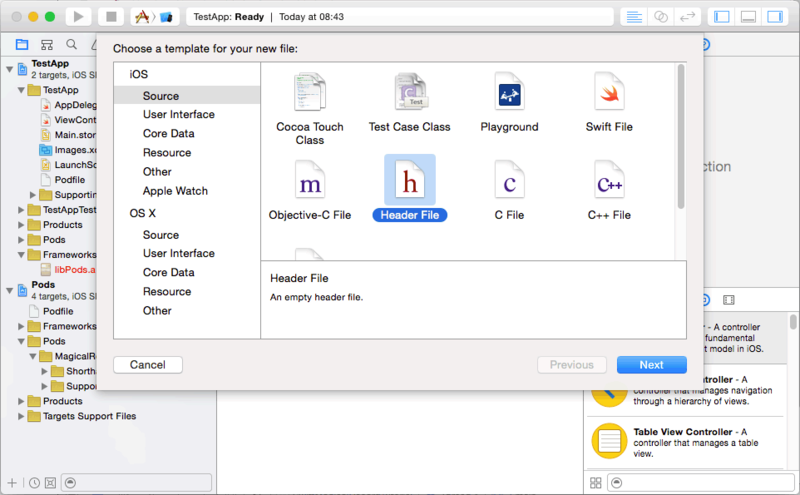 If/when MagicalFramework is converted to Swift, we’ll be able to revisit this part of the setup. 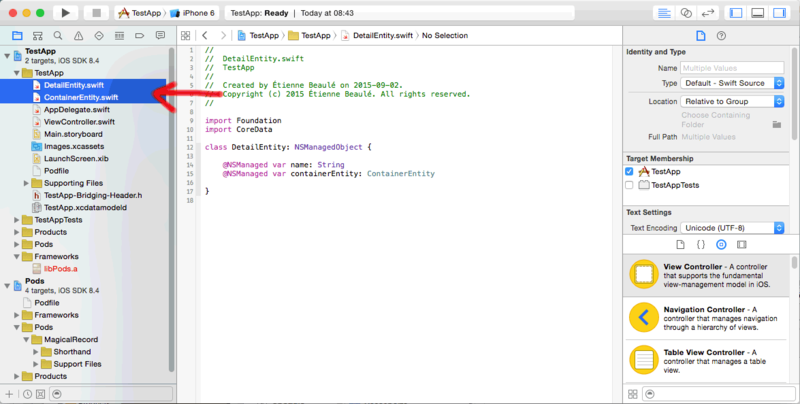 The source line tells CocoaPods where to grab the package info. The pod line tells which pod we want to have installed by CocoaPods. Note the Shorthand part – this is important. [!] 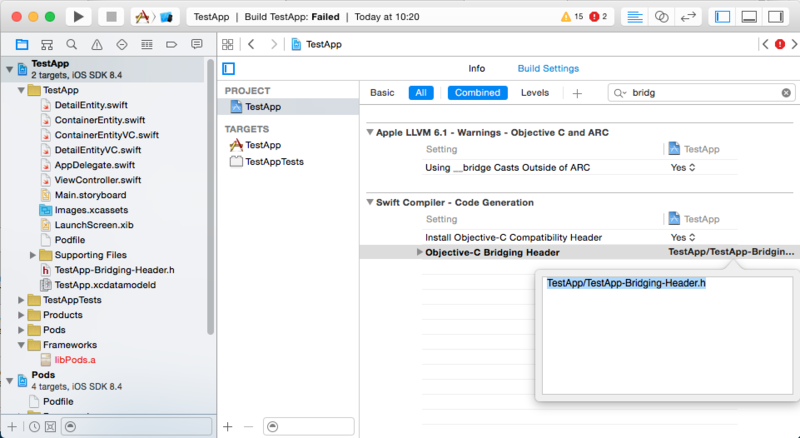 Please close any current Xcode sessions and use `TestApp.xcworkspace` for this project from now on. Notice that the podfile has been added under “Pods” (you can edit it from there now and remove the earlier reference). 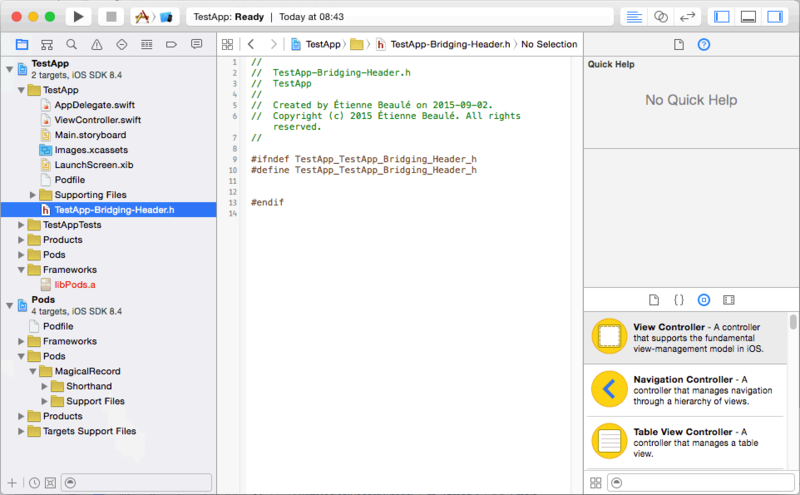 … and call it TestApp-Bridging-Header.h (the naming convention for these file is <AppName>-Bridging-Header.h. //  Created by Étienne Beaulé on 2015-09-02. //  Copyright (c) 2015 Étienne Beaulé. All rights reserved. 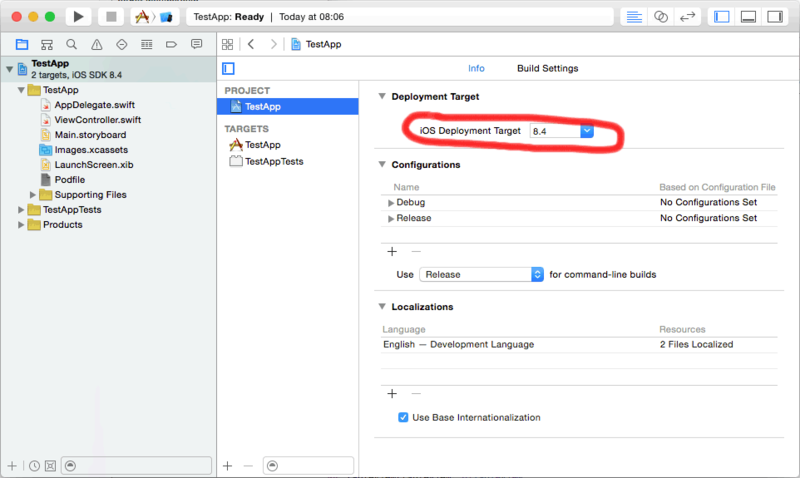 By setting this up at the project level, it will apply to all targets (including debug and release), which is what we want. At that point, we should be creating a data model writing some code to confirm that everything works as it should. I’ll follow the steps from James Leist’s tutorial here. 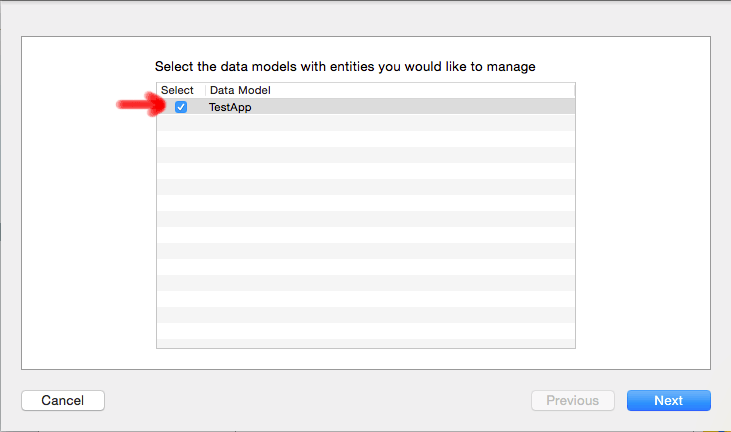 In the next screen, name the model file after the application’s name (i.e. TestApp). You can use another name if you want but if you do so, MagicalRecord won’t automatically know what model file to use (no big deal, you can specify it and this is documented in MagicalRecord’s docs). DetailEntity should have a ont-to-one relationship with ContainerEntity. Name the relationship “containerEntity” and make sure to set the inverse relationship. The following screenshots provide details and pointers as to where you can set this up for each entity. 2015-09-02 10:41:33.240 TestApp[23765:1245743] CoreData: warning: Unable to load class named 'TestApp.ContainerEntity' for entity 'ContainerEntity'. 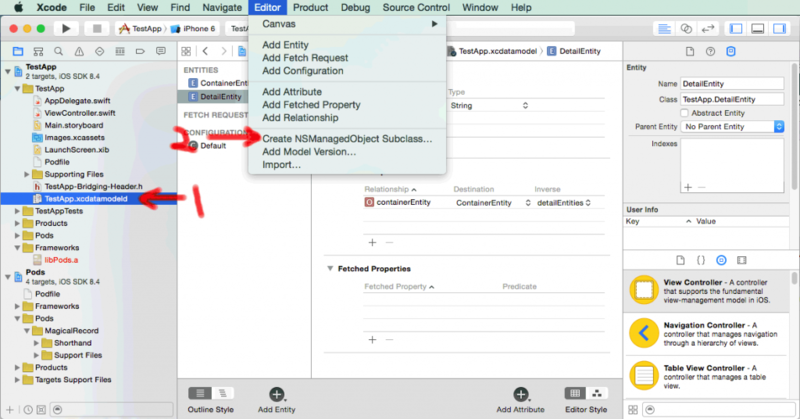 Class not found, using default NSManagedObject instead. Could not cast value of type 'NSManagedObject_ContainerEntity_' (0x7ff1217861a0) to 'TestApp.ContainerEntity' (0x10249ce60). 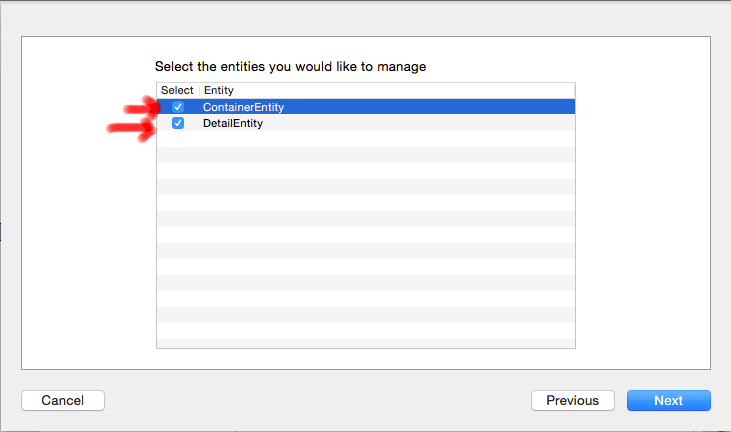 … it is most likely due to a mismatch between the Entity class name. Once this is all done, everything should work and MagicalRecord should do it’s thing. 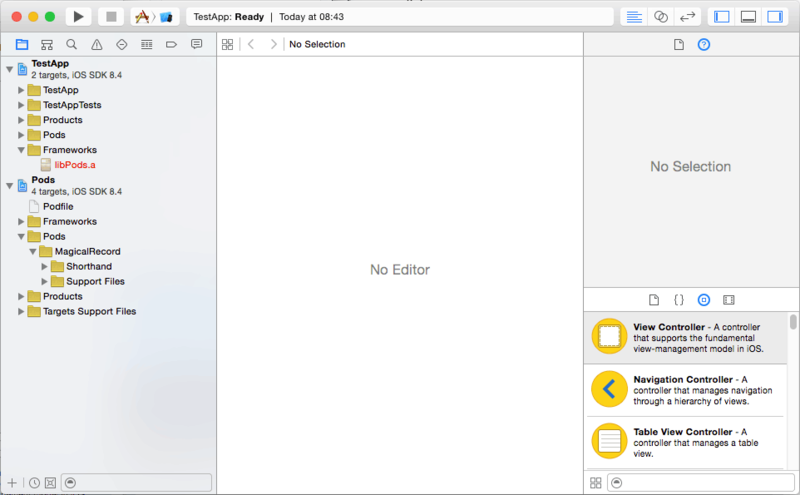 I’ve been working on an iOS 8 version of MyMSC App for some time (since the early developer previews). I’m taking the opportunity to make several under the hood code optimizations (notably on the record page, which is currently crashing due to some updates on the mymsc.ca site). Be patient – I should have something within a couple of weeks! Welcome to the new www.colddiver.com!